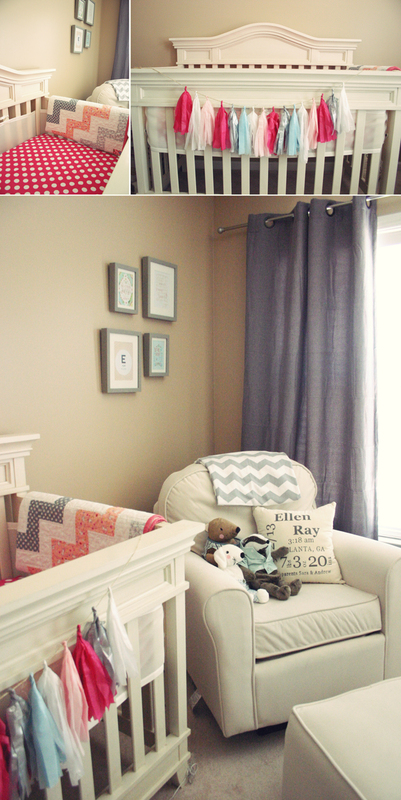 Well it’s only been 7 months and I am just now getting around to putting up some pictures of Ellen’s nursery. It took the longest time to decide which of our spare rooms would become her room…..both being about the same size. We decided to go with the room she is in currently, because the opposite room is over the garage and gets INCREDIBLY warm during the summer months. The only downer to her room now is the fact that it has double windows and is on the front side of the house. That’s where her blackout curtains and sleep sheep come in handy! We absolutely LOVE our glider Andrew’s mom got us before Ellen was born. It is the most comfortable chair ever and there have been plenty of nights where either of us has ended up sleeping in it. Andrew’s Aunt also gave us the beautiful printed pillow with all of Ellen’s birth stats on it. Love. 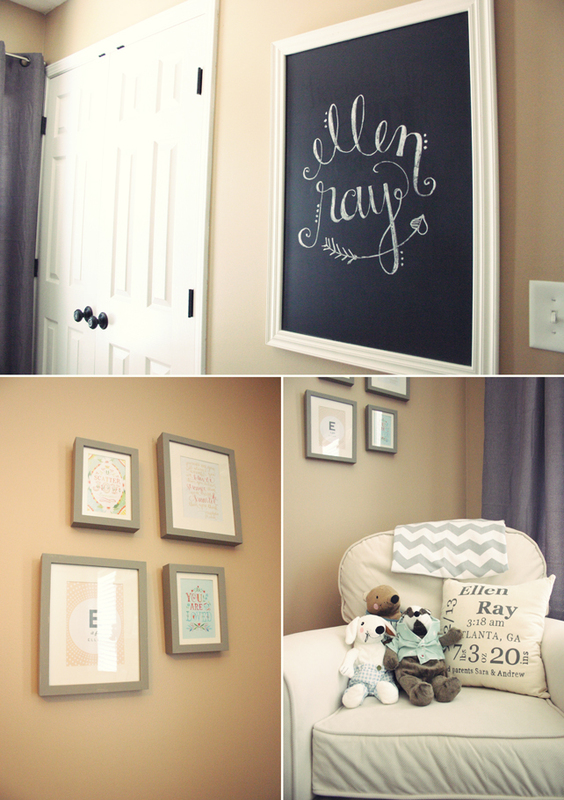 I also kept going back and forth between white or black picture frames and then finally decided to paint them with the Annie Sloane chalk paint I used for Ellen’s furniture. No priming or sanding required! Easy cheese. Books, books, and more books! Can’t have too many. 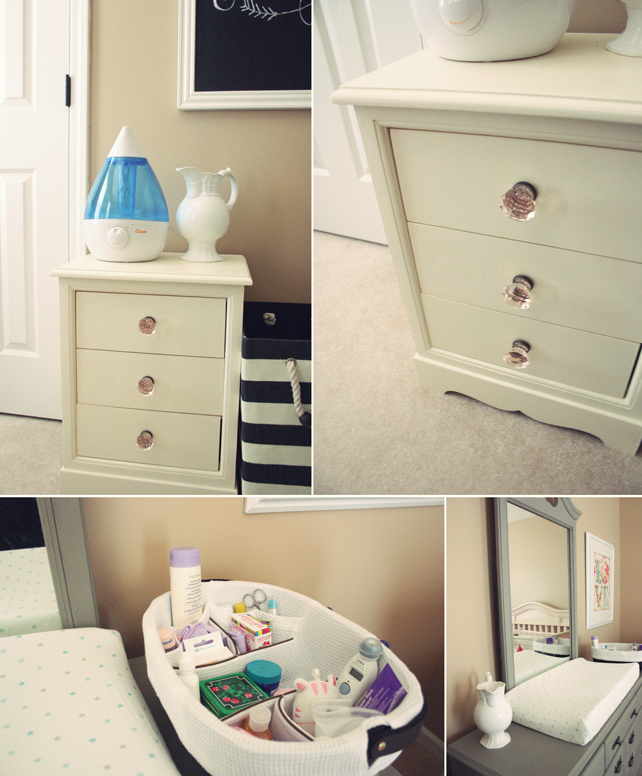 We decided to use a dresser we already owned as Ellen’s changing table and just use the top three drawers, as well as the diaper caddy, to store all of the essentials….lotion, desitin, diapers, wipes, etc. The small painted, cream dresser was a gift from our good friends Heath and Dan, dressed up with some cute knobs from Anthropologie! We clearly don’t have an issue with storage! The only thing we didn’t really get to is the closet, but that would be enough for an entire post on it’s own!